"In 1933, the Nazis disbanded the Weimar unions and replaced them with the new and improved union, the German Labor Front (Deutsche Arbeitsfront, DAF), which was comprised of 2 primary entities, the National Socialist Factory Organization and the National Socialist Trade and Industry Organization. The labor contracts that were Weimar contracts were now DAF-honored contracts. The Nazi’s funded the DAF’s coffers with the Weimar unions’ stockpile of wealth (the existing unions were part of that inflation problem)." 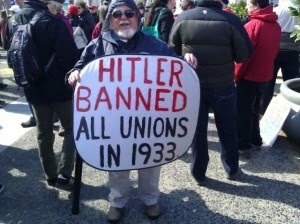 Assuming Baynes is correct, Hitler substituted new unions for old unions. I'm not one to shill for Hitler, but it appears that, if Baynes is correct, then the inscription upon the gentleman's poster above is misleading. I'm not sold on Baynes history credentials, thus I'm open to criticism of her claim about Hitler and unions. The rules governing deductive reasoning simply do not permit this kind of inference. In any deductive syllogism, the middle term, the only term absent from the conclusion, must be distributed at least once. Here, the middle term C is distributed in neither premise. A Venn diagram very easily demonstrates how this conclusion does not follow from the premises. Now its true that both men chose to frustrate the pursuits of unions, but what the gentleman above and his like-minded demonstrators imply, falsely I might add, is the allegation that this fact is relevant. The argument is an example of an ad hominem that imposes guilt by association; it very sleazily attempts to graft the wickedness of Hitler unto Walker by emphasizing the fact that both men subverted unions (albeit in very different ways). The error of course in this argument is that it treats Hitler's subversion of unions as an essential feature of his character when it certainly was not. When historians offer their own moral estimates of Hitler, they tend to emphasize the fact that he personally ordered the invasions of Eastern and Western Europe, including Norway, North Africa, and put some 6 million plus Jews, gypsies, pacifists, communists, socialists, and homosexuals to death in now notorious places of confinement. These decisions are underscored by historians because they were his most consequential and his irrevocably abysmal reputation is the result of universally negative assessments of these decisions. By contrast, historians pay considerably less attention to Hitler's opinion of impressionist art or the affection he displayed towards his dog because these decisions, while making for odd trivia, were completely inconsequential. Its the most consequential decisions of an individual that should be afforded the most weight among the decisions he makes when a normative assessment of him is conducted. Furthermore, if those most consequential decisions are malevolent ones, then the overall normative evaluation should be negative due precisely to the fact that these are the most consequential decisions that have been assessed as immoral. Not only was Hitler's union subversion historically insignificant, it is only superficially similar to Walker's union subversion. According to Brooke Baynes, Hitler abolished the Weimar unions, including private sector unions, and replaced them with unions with whom the Nazis could be politically allied. He thereby nullified the right to unionize within the private sector as labourers saw fit. Conversely, Gov. Walker has not abolished the right to unionize; instead he has expunged the right of public sector unions to negotiate with the government firms they are employed with over anything other than wages. It is imperative to acknowledge this distinction. Hitler's union subversion was an example of introductory coercion; he disbanded institutions that were either voluntary or could have been modified as voluntary organizations. In contrast, Walker's union subversion was a response to and hedge against introductory coercion. The government firms for which Wisconsin's public unions work are, on the whole, inefficient enterprises thriving on the tax dollars coercively removed from the private sector. They are benefiting from the introductory coercion employed by the state government against private sector employers and employees. By reducing the ability of public sector unions to benefit from the introductory coercion of the state government, Walker is mitigating said coercion, not resorting to it - very much unlike Hitler. I'll conclude by arguing that the ridiculousness of this argument is most vividly revealed when all of Hitler's decisions are taken into account. According to his Wikipedia entry, "Hitler oversaw one of the largest infrastructure-improvement campaigns in German history, with the construction of dozens of dams, autobahns, railroads, and other civil works." If this is the case, then would it be appropriate for opponents of government construction projects to file into capitol buildings with placards reading "Hitler commissioned highways" or "Hitler ordered the construction of railroads"? The anti-Walker protesters, with whom government construction projects are undoubtedly popular, would resent such an underhanded insinuation, yet this is what they resort to (some of them) when they imply that Gov. Walker is meaningfully comparable to Hitler. Well, how about some common courtesy?